In order to meet the variegated demands of our clients, we have come up with Vertical Stranding Machine. These are designed with utmost precision by our experts using advanced technologies to ensure high speed production of P. C./G. I. wires. The machines is provided with a rust-proof coating to prevent corrosion and improve the life of machine. These products are highly appreciated for their attributes like rugged construction, easy operations, high performance, low maintenance and durability. We offer a high quality range of Stranding Machines that are used for armoring Aluminum and Cuprum Cables over Wire & Con-centrical Coiling Cables. These machines are robustly constructed and guarantee a long service life with minimum maintenance. This range of products is specially designed for high speed production of P.C./ G.I. Wires, Cables and Conductors. Our range of stranding machines is well-equipped with variable drives for increased efficiency. 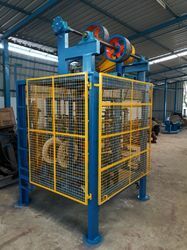 Looking for Vertical Stranding Machine ?